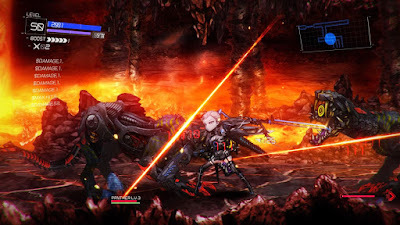 Earth’s Dawn, a new sidescrolling action RPG from Japanese developer OneOrEight, will immediately capture your attention with a fantastic art style and fascinating concept that mashes a story similar to Gears of War with your favorite anime to create something awesome. 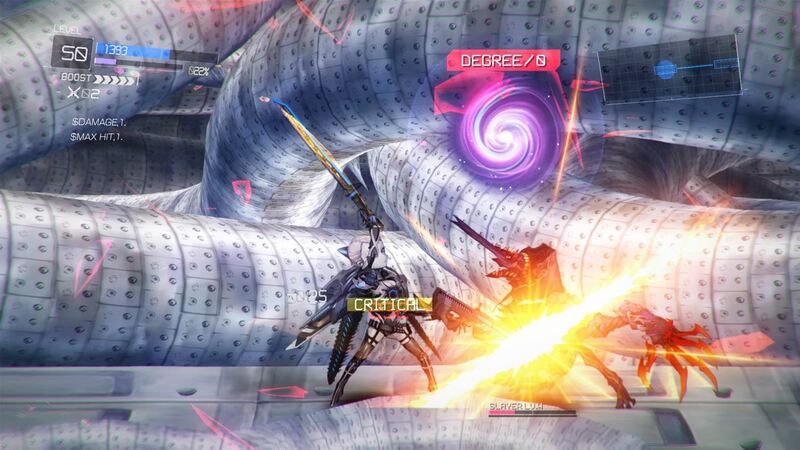 The combat, too, is very promising with a surprising amount of depth for a 2D beat-em-up. The only thing that really drags Earth’s Dawn down is an overwhelming amount of sorting through confusing menus for skill management and crafting new weapons. Earth’s Dawn is definitely one of those games that would have greatly benefited from choosing a single genre and getting that right rather than trying to do so much at once. It is good, but would be better with some edits. 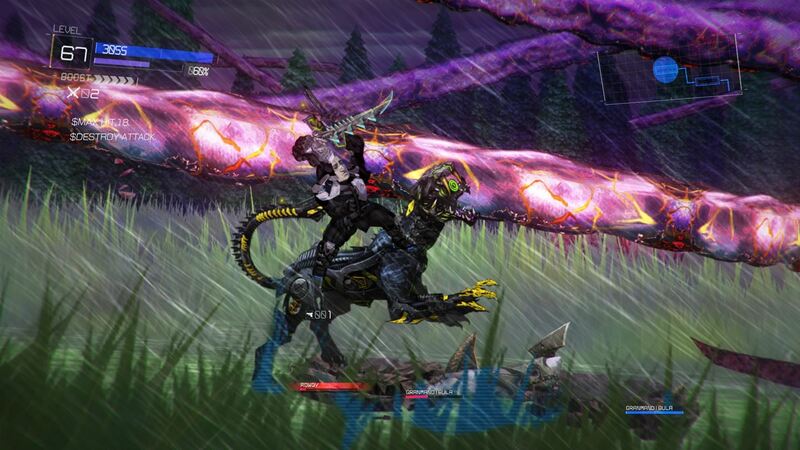 See our full XONE Earth’s Dawn review for details. Earth’s Dawn takes place in a post apocalyptic world where aliens have invaded and decimated mankind. You play as a member of a squad of specially equipped soldiers that boldly venture into alien held territory and try to take it back by hacking and slashing through dozens upon dozens of creepy enemies until the job is done. That’s the cliff’s notes version, anyway. The story is told through static cutscenes with Japanese voice over, but honestly, it is kind of hard to follow. All you need to know is that there are aliens, you have advanced weapons, so go kill stuff. The gameplay takes place on a 2D plane and plays out like a beat-em-up. You have a sword and a gun and by using them properly together you can create devastating combos. There is also a fantastic movement system where you can jump and boost through the air multiple times in order to reach new heights or simply juggle enemies in the air. Different enemy types require different tactics, so learning how to fight and dodge and boost around effectively is vital. The combat is pretty intuitive and the movement mechanics feel great. When you get it all figured out, Earth’s Dawn can be a ton of fun to play as there is a lot of depth here. It reminds me of a Platinum Games action title, just in 2D, which should be taken as the highest of praise. What happens in between missions is where Earth’s Dawn might start to lose you, however. This isn’t just an action game, but rather an action RPG, which means it is loaded with systems and subsystems and stats and skills and all sorts of stuff you have to try to keep track of. The first big chunk of your time with the game is spent introducing you to all of this, but not really explaining how any of it works, and it gets overwhelming almost immediately. Part of this feeling of being overwhelmed is that crafting weapons plays a big part in Earth’s Dawn. The idea is that normal human weapons can’t beat the aliens so you infuse the bits and pieces of the aliens you pick up during battles into your weapons and armor to make them stronger. Not only can you make your existing weapons better, but you can craft totally new ones as well. It is an interesting concept for sure, but there is just so much “stuff” involved that even after several hours of play I’m still not sure I’m actually doing any of it correctly. All I know is that I’m making numbers go up, which means my stuff is getting better. It also has to be said that the mission design isn’t spectacular here. There are only a handful of levels that you return to over and over and over again, albeit usually with different enemy configurations, for the dozens upon dozens of missions, though many of them are less than a minute long. The missions are all almost exclusively “Kill everything you see”, too, which means you’re going to the same place and doing the same stuff an awful lot. You also learn fairly early on that, despite the fact the combat does have a lot of depth, your best bet is to stick with the same handful of super effective combos for pretty much the whole game. This makes the game pretty darn repetitive fairly quickly. With that said, however, Earth’s Dawn kept me coming back for a couple of reasons. One, I really, really love the art style. You get to slightly customize your character and I just love the sort of gritty anime look to it all. Also, while the combat can be repetitive and sort of button mash-y, it can still be really, really satisfying and fun. Honestly, Earth’s Dawn reminds me quite a bit of Phantom Breaker Battlegrounds (criminally underrated and under appreciated beat-em-up that is BC on XONE if you want to play it …), so if you enjoyed that game there is a good chance you’ll like Earth’s Dawn too. All in all, Earth’s Dawn has some mission design issues and is a little too complicated for its own good, but the core gameplay and art style are pretty fantastic and make it worth a look for action RPG and beat-em-up fans. The $30 asking price is a bit over the top, but it does offer a ton of depth if you are willing to dig in and really learn how everything works. It can also be said that it is one of the most distinctively Japanese games on Xbox One at the moment, which also definitely gives it a certain appeal. Action RPG and beat-em-up fans will find a lot to like in Earth’s Dawn and should check it out.